Given its location in the heart of Mumbai, it is rather surprising that these 530 acres took so long to register on the radar of land developers. Salivating at the thought of prime commercial and residential potential, companies like Mitsubishi, Godrej and Reliance have begun applying serious pressure on the Mumbai Slum Rehabilitation Authority to get a move on the Dharavi Development Project(DDP). This, to no one’s surprise, has not gone down well with the Dharavi residents themselves who are vigorously defending the status quo. To the outsider, it might seem like a stinking blot on the urban Mumbai landscape, but to these 600,000 people(more than twice the size of Fremont) it is a hard won piece of territory that has been shaped, asbestos sheet by asbestos sheet, to suit their unique needs. Also it is a small industrial park, producing about $500 million dollars of goods a year. For the Indian American, the situation has some striking parallels with the immigration issue in this country. I find myself vacillating daily in my stand on illegal immigration. On one hand, immigrants like myself who went through the painful legal process have little sympathy for people sneaking across the border. On the other hand, my cleaner and gardener are probably undocumented( I claim the ignorance defense!) and provide me with cheap services that satisfy my miserly desi heart. As the spoof, ‘Day without a Mexican’ tried to demonstrate, the American economy, specially the agrarian part of it, would come crashing down if all the undocumented aliens all got deported one day. Like the immigration situation, it is difficult to take a unilateral stand on the DDP. It may be an eyesore preventing Mumbai from joining the league of gleaming global metropolises, but Dharavi and its inhabitants are so entwined in the fabric of Mumbai’s economy that trying to alter it will create a scar that the city may never recover from. The large number of legal and illegal businesses that operate out of the area have created an economy that supports not only local businesses but also politicians and policemen. So you can see why I am quite sceptical about the future of this project. As I see it, the scenario will go like this – the developers will begin the high rise construction – where will the workers come from? Why, Dharavi, of course? Then ration cards will be used to determine which of the residents are eligible for the flats- we know how efficient that it going to be( see Hindol’s Sengupta’s article ‘I am Chandan Das’). This will result in a tremendous amount of confusion and possible riots as half a million people vociferously claim their bit of land. Eventually the rest of the area will be developed, squeezing out the remaining residents , who will then create little pocket slums around the development( after all, where are the janitors, cleaners, security guards and maids going to come from?). As for the space allotment for the slum families, the 225 sq.ft allotted to each family is woefully inadequate and does not take into account the varying economic situation of the residents, some of whom have enterprises in over 3000 sq. ft. of land in the area. Also the system of identifying current residents by their ration cards is laughable in a country where falsifying documents is easier than opening a bank account. Of course, all this presupposes an agreement between the government and the slum dwellers. The Dharavi Bachao Andolan has already started taking out morchas protesting the development. It wants all redevelopment to concentrate on improving existing living conditions rather than introduce new development that would displace them. This is naturally raising the ire of the local government, given that the residents are basically squatting on its land. If it weren’t for the fact that I know exactly where the development money is going to end up, I would feel some sympathy for the Mumbai Municipality. After all, which Mumbai lover does not want the Bandra-Kurla stretch to be cleaned up? Call me a fatalist, but I don’t see the slum situation disappearing till some sytemic changes are made to provide regional jobs for all the people migrating to the city. ( similar to the illegal immigration in this country, which is never going to be solved till Mexico gets its act together.) Also, till we acknowledge that the support staff of maids and drivers we take for granted need some sort of low cost housing to survive in a big city, we ourselves are enabling the growth of slums. There is an enormous amount of money and political will behind these latest plans to develop Dharavi. From 7000 miles away, it is a social experiment I am dooming to failure but will nevertheless watch closely. This entry was posted in Features on June 26, 2007 by vpdot. // This comment is an attempt of a middle class man who cant afford to buy a decent home in Mumbai to vent his frustration, my apologies if it seems rude. Dharavi needs to be redeveloped, come what may, the survival of Mumbai now hinges on the redevelopment of Dharavi and the slums encroaching on the airport land. I really don’t understand why so much of hue and cry is being made on the plight of the slum dwellers, these people have illegally encroached on valuable opens paces. Mumbai needs to reclaim every inch of precious real estate or else survival of the city itself is uncertain. The slum dwellers are literally holding to ransom, and are getting free houses in return, while honest middle class people can only dream of buying a house as the real estate prices are simply unrealistic, thanks to encroachments by slum dwellers. Dharavi has a lot of business activity, but most of the businesses there are illegal and extremely polluting and hazardous to the environment. Why should an extremely precious piece of real estate right next to the CBD of BKC be allowed to be used for such worthless activities like tanning leather, making pots or recycling scrap?. And what legal rights do these slumwalas have to question the redevelopment process, how so ever flawed it might be? These people are encroachers, they have broken the law of the land, they have no right to demand compensation. They should take whatever the government is giving and move over to some place outside city limits to setup their businesses. That is a perfectly valid point of view, Randhir. The question is, is it enforceable? As a friend pointed out, in Mumbai it is better to buy a flat next to a slum, since it is impossible to get servants otherwise! It is easy to see these people as encroachers, and indeed they are, but a) they serve a purpose and b)if they are removed they will simply be substituted with other people from the interiors. Sorry I have not read the article. My intention is to bring my thoughts about the slum development to the developers. Hope they reach them through this. People living in slums all their lives will never adapt to life in closed up high rise blocks. 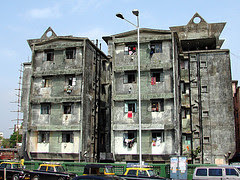 If you consider CHAWL TYPE BLOCKS (blocks joined by a common corridor), they will be more amicable to those who are not resisting the high-rise blocks. I now live in Australia (past 20 years). Some things developers plan here are parks and safe play equipment for children within the developments. Would love to see something where paople would want to live, and not resist the change.